Between Mont Blanc and Lake Geneva, the real paradise of Les Gets is located. This resort is a part of Europe's largest ski area - Port Du Soleil. It is 6 km away from Morzine, so if you wish you can visit this amazing resort of the French Alps. Unlike other ski resorts and, first of all from Avoriaz, Les Gets is a resort for skiers of an average level and family rest. The main principle of Les Gets is hospitality. The locals are always friendly and welcoming. The spirit of a typical Savoy mountain village here seems to be in the air. The architectural style pleasantly pleases the eye and looks harmoniously against the background of amazing landscapes in its beauty. Wooden and stone chalets are scattered on a vast territory, most of the housing is located close to the main ski lift station. Many historical and cultural sights have been preserved in Les Gets. The day here begins and ends with skis. Right from the doorstep of your hotel, you can ride along cosy streets, without removing skis at the same time. The romantic atmosphere of Les Gets will delight and bless for many years the happiness of the newlyweds. Huge opportunities for recreation with children will attract family couples. A large circle and the standard of shops will entice every woman. Excellent slopes, comfort and convenience of hotels, as well as reasonable prices will be pleasant for all guests of the resort. Ski holidays in Les Gets is a small fairy tale of ordinary and grey everyday life! The small ancient village of Les Gets, leading its history from the 11th century, has managed to preserve deep traditions and true historical charm. Les Gets is located at an altitude of 1173 meters at the edge of the Port du Soleil area only 6 km from Morzine, and has the latest combined home skiing area. 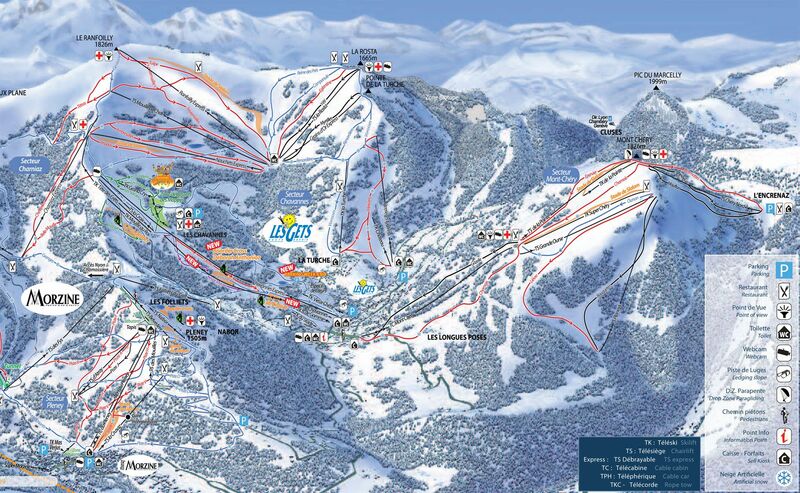 It is possible to purchase a ski pass for the home skiing area and for the entire Port du Soleil area. Here, in Alps2Alps, we proud of offering the most comfortable and reliable transfer services to alpine ski resorts for our customers. And you can be sure of the most beneficial transfer price at any time. It does not really matter when are you planning to make your trip, even at the peak of the season, we still guarantee the most profitable and safety transfer to Les Gets for you, your family or friends company. You can be 100% sure that the base price of ski transfer for you will be minimal and most profitable. We never overstate prices for our customers. In order to save money, we advise you to book a transfer for the middle of the week, or after the high season. On weekdays Alps2Alps make a very substantial transfer discount up to 60%. Your final transfer cost will also depend on such list of factors as availability of the vehicle, transfer schedule, use of the vehicle, toll roads and parking charges in the airport. One more thing: if you are going to travel by a large number of persons with your, or you have any additional requirements, please contact us to discuss all these issues. The own slopes of the resort are much larger and more diverse than in any other resort in Port du Soleil, and are perfect for skiers of the middle class. The variety of trails makes it possible for the first time to get on skis even for children. There are adults and children's schools of mountain skiing and snowboarding. Besides, Les Gets is also a part of the Franco-Swiss Portes du Soleil Domain. Inexpensive prices for accommodation and services, a pleasant atmosphere, a large selection of individual chalets for families and large companies, special conditions for recreation with children - all this is a good argument for a holiday at this resort. At Les Gets you will be offered of a lot of festive events for the whole family: there are many reasons for the holiday: "Santa Claus lives in Les Gets", Snow Carnival and much more. The program of events is available on Saturdays weekly from the tourist office. For fans of active leisure, there are discos and a well-equipped fitness centre with a swimming pool and a closed ice rink. There are only about twenty restaurants. It is worth to visit the fun museum of mechanical jukeboxes, located next to the church. Choosing transfer services in Alps2Alps you can be completely sure of reliability, punctuality and the highest quality level of services. We guarantee our clients a very comfortable transfer to the ski resort in a family-friendly atmosphere. Maybe you know this rule: as the high season approaches, the transfer prices are also growing up very faster and faster. So, don’t delay it for tomorrow – book your shuttle to Les Gets right now! If you have some more questions, just give a call to our specialists and ask them for help. Don’t doubt, they will inform you according to your wishes. Let your ski holiday start the best way with a little assistance from Alps2Alps!